Sleek elegance. A simple ‘plane’ of white gold dangles off a ‘line’ of yellow gold wire. 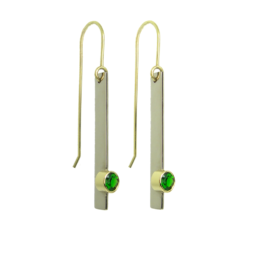 On the edge of the plane rests a single Imperial diopside set in contrasting yellow gold. 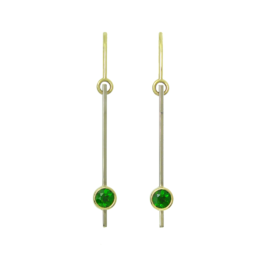 18k white and yellow Fairtrade gold, set with 4mm responsibly sourced, natural Imperial Diopside. These gemstones are hand picked from the rocky hills in Siberia during the warm months; the rich green colour is due to trace amounts of chromium, the same element responsible for the green in emeralds and red in rubies. 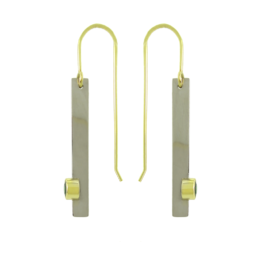 The earring with stone measures 30mm high x 6mm deep x 6mm wide. The hook adds another 11mm in height.